Remember the easy chicken stock recipe for 1-dish meals I shared last week? Here’s another homey 1-dish meal that you can whip up using the soup as well as the chicken meat and the great news is that it’s suitable for both young and old. 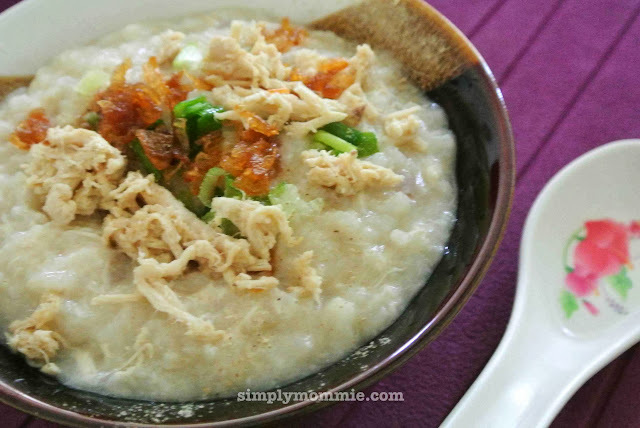 Anyway, because the stock is already packed with flavours and the I add seasoning to the cooked shredded chicken meat, there’s hardly a need to add any other condiments to the porridge. Simply ladle out the porridge, top with more chicken, fried shallots and shallot oil, spring onions and white pepper (optional). This is definitely a great dish to cook in this cool season of the year! 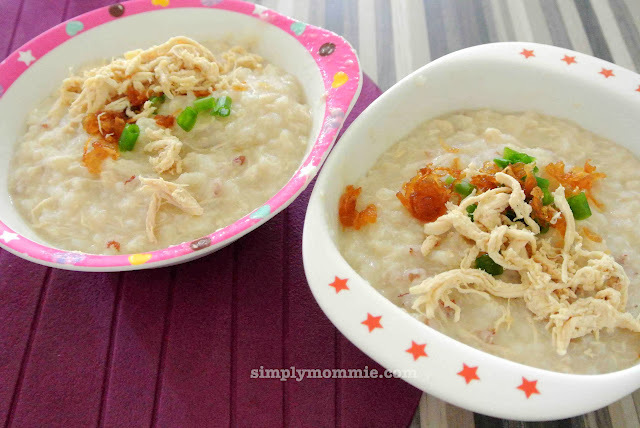 Smooth chicken congee for all ages to enjoy! Cook rice grains in rice cooker on porridge/ congee function with the water. When it's done, add the chicken stock to the porridge and cook one more cycle on the porridge/ congee function. Season the cooked chicken breast with the condiments. Ten minutes before the congee is done, add in most of the shredded chicken breast, leaving some as garnish for each bowl. 1. I cooked the chicken breast when I made easy chicken stock for cooking one-dish meals. (Click the link to get to the easy chicken stock recipe for 1-dish meals). The leftover chicken breast meat (approximately 250g) which wasn't used in the 1-dish meal was used to cook this chicken congee. 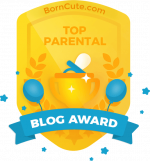 This entry was posted in 1-dish meals, Chicken, Chinese Food, Food for kids, Recipes, Recipes for the family, Sample toddler meals, Soups and tagged Porridge. Bookmark the permalink.